A galvanometer is an instrument used to detect the presence of an electrical current in a circuit or to measure the value of the current in amperes. The operation of practically all galvanometers is based upon the same principle, and they differ chiefly in mechanical construction and the relative arrangement of their different parts. A very simple galvanometer, that will give quite satisfactory results, under favorable conditions, may be constructed as follows: Turn from a piece of hard wood a ring having dimensions corresponding to those given in the cross section, Fig. 1. Fill the groove in this ring to within 1/8 in. of the top with No. 18 gauge double-cotton-covered copper wire, insulating the different layers from each other by means of a layer of good bond paper. The winding may be started by drilling a small hole through the side of the groove, as close to the bottom as possible, and allowing about 6 in. of the wire to protrude through it. The outside end may be terminated in a similar manner, and the two ends should be on the same side of the ring, or as near each other as possible. A protecting covering of bookbinder's paper is placed over the winding and the completed ring given a coat of shellac. The electric current to be detected or measured is to pass around the winding of this coil and produce an effect upon a compass needle mounted in its center. In order that the current may produce a maximum effect upon the needle, the coil should be mounted in a vertical position. The base upon which the ring is to be mounted may be cut from some 1/2-in. hard wood. It should be circular in form and about 5 in. in diameter, and have its upper edge rounded off and shellacked to improve its appearance. The ring is mounted in a vertical position on this base, which may be done as follows: Cut a flat surface on each of the flanges of the ring so that it will stand in a vertical position and the terminals of the winding will be as near as possible to the surface upon which the ring re s t s. Then form a stirrup from some thin sheet brass, similar to that shown in Fig. 2, so that it will fit tightly over the ring and its outwardly projecting ends will rest upon the base of the instrument. Small wood screws are used in fastening the stirrup to the base. The fastening may be made more secure by cutting a groove across the inside of the ring for the stirrup to fit in, Fig. 3, thus preventing the possibility of the ring moving through the stirrup. Two holes should be drilled in the base for the terminals of the winding to pass through, and it would be best to cut two grooves in the side of the ring for these wires so as to prevent their coming into contact with the metal stirrup. Two back-connected binding posts, A and B, Fig. 3. are mounted on the base and the ends of the winding attached to them. The wires should be placed in grooves cut in the under side of the base, and the screws used in fastening the binding posts should be countersunk. A short compass needle is then mounted on a suitable supporting pivot in the center of the coil. This compass needle will always come to rest in an approximate north and south position when it is acted upon by the earth's magnetic field alone. 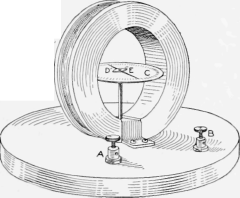 If now the plane of the coil be placed in such a position that it is parallel to the direction of the compass needle (no current in the coil), the magnetic field that will he produced when a current is sent through the winding will he perpendicGalvanometer as It is Used to Detect the Presence of an Electrical Current ular to the magnetic field of the earth and there will be a force, due to this particular current, tending to turn the compass needle around perpendicularly to its original position. There will be a deflection of the needle for all values of current in the coil, and this deflection will vary in value as the current in the coil varies. The mere fact that the compass needle is deflected due to a current in the coil gives a means of detecting a current in any circuit of which the coil is a part, and the degree of this deflection affords a means of measuring the current, the value of the different deflections in terms of the current in the coil having been experimentally determined by sending a known current through the coil and noting the positions of the compass needle for each value of current used. In order to determine the deflection of the needle, a scale, C, Fig. 3, must be mounted directly under the compass needle and a pointer, D, attached to the compass needle so that any movement of the needle results in an equal angular displacement of the pointer. The compass needle, E, should be short and quite heavy, say, % in. in length, 1/16 in. in thickness and 1/4 in. in width at its center, and tapering to a point at its ends. It should be made of a good grade of steel, tempered and then magnetized by means of a powerful electromagnet. The reason for making the compass needle short is that it will then operate in practically a uniform magnetic field, which exists only at the center of the coil. On account of the needle being so short and in view of the fact that it comes to rest parallel to the coil for its zero position, it is best to use a pointer attached to the needle to determine its deflection, as this pointer can be made much longer than the needle, and any movement of the needle may be more easily detected, as the end of the pointer moves through a much larger distance than the end of the needle, and since it may be attached to the needle, at right angles to the needle's axis, the end of the pointer will be off to one side of the coil and its movement may be easily observed. The pointer should be made of some nonmagnetic material, such as aluminum or brass, and it should be as long as it may be conveniently made. A suitable box with a glass cover may be provided in which the needle, pointer and scale may be housed. The construction of this box will be left entirely to the ingenuity of the one making the instrument. In order to use this instrument as an ammeter, it will be necessary to calibrate it, which consists in determining the position of the pointer for various values of current through the coil. It will be necessary to obtain the use of a direct-current ammeter for this purpose. The winding of the galvanometer, ammeter, battery and a variable resistance of some kind should all be connected in series as shown in the diagram, Fig. 4. Allow the compass needle to come to rest under the influence of the earth's magnetic field and then turn the coil into such a position that it is as nearly parallel with the needle as possible. This corresponds to the zero position, and the instrument must always be in this position when it is used. The position of the ends of the pointer is now marked on the scale for different values of current, first with the current in one direction and then in the opposite direction. The deflection of the needle will, of course, reverse when the current is reversed. The effect produced by any current upon the compass needle can be changed by changing the number of turns in the coil. In measuring a large current, a few turns of large wire would be required, and in measuring a small current, a large number of turns of small wire could be used. In other words, the size of the wire will depend upon the current it is to carry and the number of turns in the coil will depend upon the magnetic effect the current is to produce, which is proportional to the product of the number of turns and the current, called the ampere-turns.